As the iPad becomes popular in the enterprise, business-focused apps have emerged to help perform functions like web conferencing. 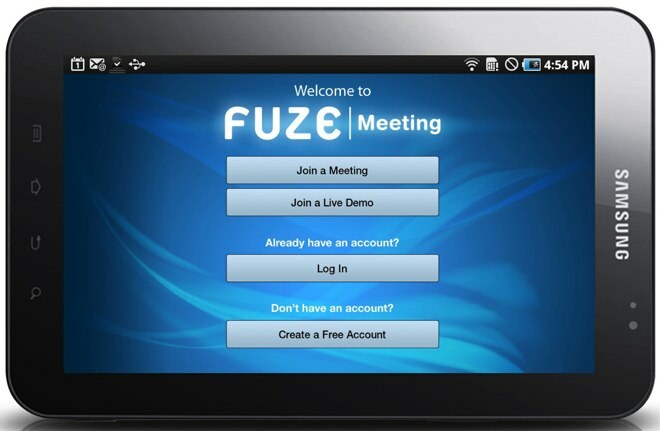 Fuze Meeting recently launched its online meeting software on the iPad with a new app. Similar to GoToMeeting or WebEx, Fuze provides a conferencing service that allows users to share screens and run meetings online. As opposed to its competitors, Fuze promises a sleeker more lightweight interface. Today, the company is announcing a new app available today and specialized for Android tablets. The Fuze Android tablet app includes VoIP so users can attend a meeting via their tablet even if they don’t have a phone nearby. You can also share your computer desktop, share documents and files via the app and watch and listen to high-quality video and audio. Fuze says the app will be optimized for the Samsung Galaxy and the app works best on 1024 x 600 tablets for now. Fuze Box also has a specialized app for Android phones. By way of history, Fuze was formerly known as CallWave. The company was founded in 1998 and went public in 2004, trading on NASDAQ under the ticker symbol CALL. After reaching a peak soon thereafter of over $15 per share, the stock dropped steadily, dipping as low as 50 cents early this year. Deciding to cut its losses, the company delisted itself from NASDAQ after buying back shares from public shareholders at a 44% premium over the current market value and paying out a total of $10 million. Last summer, the company rebranded itself as Fuze Box and launched Fuze Meeting. Fuze also launched Tweetshare, a platform for branded Twitter channels, and brought on streaming media inventor Dr. Alan Lippman its Executive Vice President of Media Technology. It’s still unclear is Android tablets will gain the same traction as the iPad; but it should be interesting to compare the popularity of Fuze’s app on both types of devices.